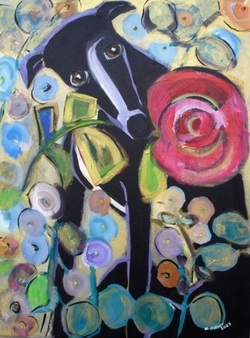 Years ago I read an article in a magazine about a woman who adopted a retired racing greyhound. It was extraordinary the tales she told about teaching her dawg how to maneuver his new digs. With no idea of the danger that daily living could offer, she watched him closely. Windows, pool, stairs. All a challenge! Seeing that gorgeous dog and reading that article I was hooked and didn't know it. The elusive Grey stayed in my mind. After I remarried and moved to Peoria IL, I chanced on an active rescue group. They took hounds off the track in Wisconsin & Texas. One day I gathered courage and called to ask, "Do they come in black?" The woman in charge said "As a matter of fact I am staring into the eyes of one at this moment!" The truth is that my own "Man" was the last of a rescued group and she was anxious to place him in a good home. I rushed over to fill out papers and secure my very own greyhound dawg! After a home visit and much deliberating (let's face it, straight off the track sometimes these creatures need lots of help) I was approved to adopt. My life changed. Images of racers filled my mind. I started painting them in 2003 and have done lots of paintings since. The pic I included on this page was done to commemorate dear Wizard. aka Jettex Buzz descended from hall of famers. He failed at the track but won my heart!